MyNetDiary provides a great, easy and most comprehensive tracker app for Android, helping people track and manage their diabetes or pre-diabetes, to keep track of blood glucose and control carbs. Whether you had diabetes for years, or you are newly diagnosed, or diagnosed with pre-diabetes - MyNetDiary has all the tools to help you, to stay in control, to eat better and feel better. The following users tracked diabetes with MyNetDiary on the web and iPhone. Our Android app has the same core features. Finally, MyNetDiary is the most advanced, modern diabetes app for the Android. It is optimized for all phone and tablet sizes. You can link MyNetDiary can with Fitbit, and Withings, automatically syncing your fitness data (included with MyNetDiary Maximum). MyNetDiary is more than just the app - you can use our online service, log foods and exercises and participate in our Online Community supported by Registered Dietitians for more help and motivation. There are many more tools in MyNetDiary - overall, there are more than 50 screens in MyNetDiary Diabetes & Diet Tracker. They are there when you need them - water tracking, notes, vitamins and a full set of body measurements - not only weight! Check out our articles on weight loss and healthful living. Send a support request from the app, we will respond via e-mail within 24 hours or sooner. 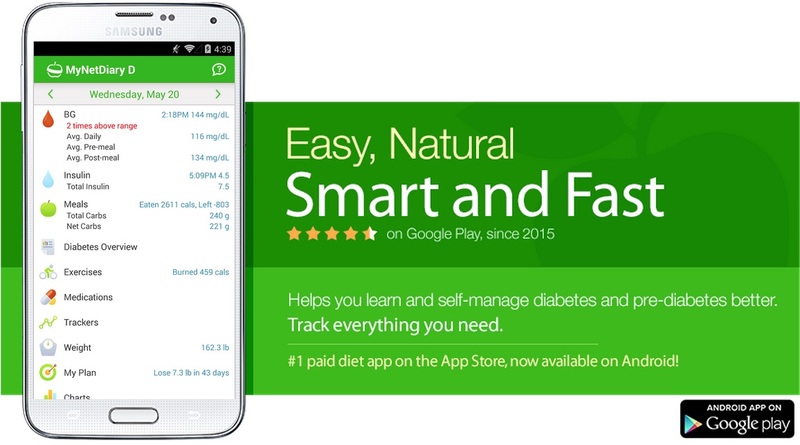 MyNetDiary Diabetes Tracker for iPhone has inspired creation of Android app. It has even richer, solid set of features and has been used by more than 50,000 people since year 2012.